Today I was sociable: I sat at the counter at Van Dam Diner and talked to the waitresses. As I ordered a spinach and portobello salad, and tried to relax on a stool (an almost impossible task), I watched one waitress wrapping three platters of vanilla and chocolate cupcakes, brownies, various cookies and peeled melons for a catering order, then carefully wrapped in balloons-stamped party plastic, so not to smear the buttercream frosting. But, not today. It’s salad day! 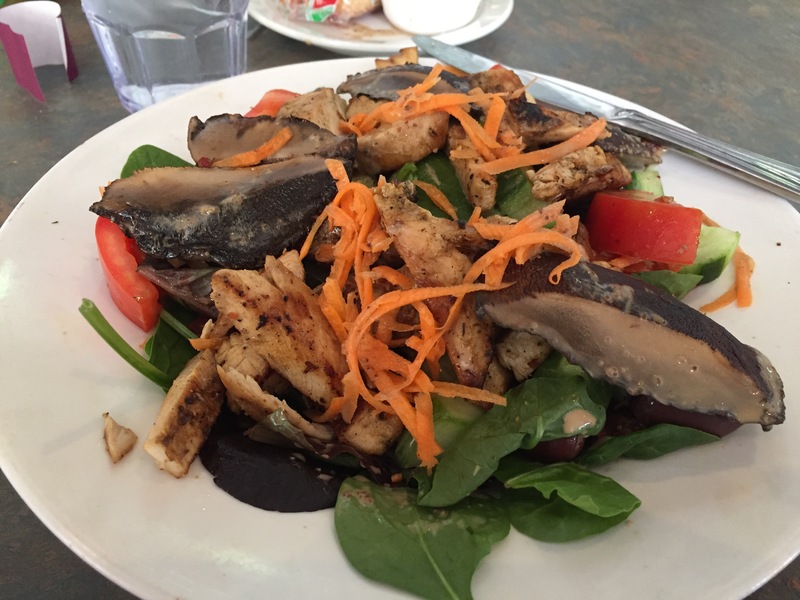 The salad, filled with grilled chicken strips, fresh spinach, shaved carrots, portobello mushrooms, cucumbers, sun-dried and fresh tomatoes, green peppers, and house dressing, was HUGE!!! The vegetables were fresh and clean, and very tasty. The chicken was tender and seasoned well. This time, I wrapped up the remains of the salad (half of the plate) and took it home later, and… I ordered a brownie for later. This was a first.